Hi there! Today I’m sharing a review for a contemporary M/M romance that threw me for an Austen-spin. Richard Natale’s LOVE ON THE JERSEY SHORE had a rough start for me, until I determined the truth: it’s Pride and Prejudice in disguise! This book, for me, was a slow starter, and I struggled for the first third… Long declarative passages, long exposition, oddly phrased, so much back story–I felt I was being TOLD a story, which I detest, but then…THEN!…I caught the groove. And the whole thing, the writing, the story, turned me onto my head…because THIS is a modern retelling of PRIDE AND PREJUDICE!!! Only the Bennett sisters are gay Italian dudes from the Jersey shore!!! OMG! So, the third person limited POV, mostly centering on Elizabeth–I mean FRANK!–that didn’t work at first became delightful in this new light. The second I caught on I WAS HOOKED. GIDDY! Could not wait for Darcy, I mean ROBERT, to unwind this quiet love affair. Here’s the low down: Frank and Anthony are cousins raised together. Anthony’s mom died when he was young and his dad was a long-haul trucker, so he pretty much moved into Frank’s bedroom. They are as close as two brothers could be, and they grow up in decent blue collar fashion. They both experiment with girls…a lot, but there’s something missing there. They find that missing piece in male companionship—are they bi? Are they gay? They mostly decide they are gay, and come out in their early twenties. As adults they are successful self-made businessmen with respectable careers in landscape design and home building/remodeling. While Anthony is looking for a life partner, Frank is reserved and not likely to won over by any suitor. Lookit, I could draw all the comparisons to Jane Austin’s classic and destroy the fantastic surprises built within, but I’m not gonna. Suffice it to say: there’s a lot of P&P going on here. It thrilled me to see this story re-worked in a way that was true to the essence of the original and completely unique. I think the ONLY thing I didn’t love was the lack of lovin’. I wanted to see all the *wink wink* happy endings. That said, there’s no ending like a happy ending and we get a twofer in this one. Anthony and Hunter and Frank and Robert. Or was it Jane and Bingley and Elizabeth and Darcy… Oh crap. I MEAN. Shoot. Good stuff! I was thrilled by the novelty and charmed by the plot. Eventually. Interested? 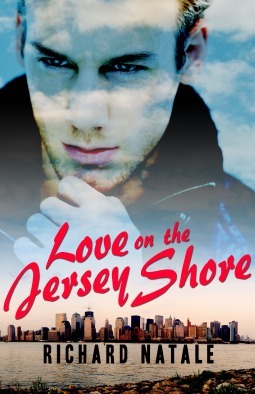 You can find LOVE ON THE JERSEY SHORE on Goodreads, Bold Strokes Books, Amazon and Barnes & Noble. I received a review copy of this book via NetGalley. Richard Natale is a reporter and editor who has written for such publications as the New York Times, the Washington Post, the Los Angeles Times, the Village Voice and Variety. He wrote and directed a gay-themed feature film romance Green Plaid Shirt, which was the closing night film at the Palm Springs Film Festival and played at 20 festivals around the world. It is currently a best-selling DVD and streaming title for Wolfe Video. He won the National Playwright’s Competition for the comedy Shuffle off This Mortal Buffalo, which was produced in Los Angeles and Kansas City. Several of his short stories have appeared in the literary magazine Wilde Oats and have been published by Torquere Press and thewritedeal.org. Richard can be contacted at via email and on Facebook and twitter.